Walter Scott, the tenth child of Walter Scott (1729–1799) and Anne Rutherford (1739–1819), was born in Edinburgh on 15th August, 1771. Walter came from a fairly prosperous family. His father was a successful solicitor and his grandfather, Dr John Rutherford (1695–1779), was a professor of physiology in the University of Edinburgh. In 1772, when Walter was only a few months old, contracted poliomyelitis and was sent to his grandfather's farm at Sandyknowle in Roxburghshire, to benefit from country air. According to his biographer, David Hewitt: "Many attempts were made to cure Scott's disability (without success), and much (successful) effort over the years was given to improving the use of the leg. Throughout his life Scott was conscious of his lameness, but it seems to have caused no psychological damage. The physical feats of later life.... suggest that his lameness did not restrict him, but at least some of this physical activity, or perhaps even the reporting of physical activity, was deliberate overcompensation for his disability." In November 1783, Scott entered the University of Edinburgh. He later claimed that the professor of Latin was incompetent and "amid the riot of his class I speedily lost much of what I had learned under Adams and Whale (at school)". In his second year he studied logic and metaphysics but as a result of illness he withdrew from the university early in 1786 without taking a degree. In March 1786, Scott was indentured to his father for five years to train as a solicitor. His work consisted mainly in copying legal documents. He wrote in his journal that he hated the work and "propose to me to do one thing and it is inconceivable the desire I have to do something else." At the same time he did not want to upset his father and continued with his training. In 1789 Scott returned to university where he studied moral philosophy under Professor Dugald Stewart. He also introduced Scott to the joys of literature. Later that year Scott he co-founded the Literary Society. Over two years the society met every Friday evening in a masonic lodge in Carrubbers Close. Members included Adam Ferguson, Joseph Black and James Hutton. Scott did not take university examinations and did not formally graduate. His main objective was to qualify as an advocate, and on 6th July 1792 he passed the Scots law examination of the Faculty of Advocates. He lost his first case, defending a drunken minister before the general assembly of the Church of Scotland in 1793. Initially it is believed that Scott was sympathetic to the French Revolution. However, after the execution of Louis XVI in January 1793, he lost all faith in political reform. In April 1794 he got involved in a fight with some anti-royalist Irish students, and was bound over to keep the peace. Later that year he volunteered as a constable to prevent popular disturbances. He also took a keen interest in the trial of Robert Watt, a former government spy who joined the Society of Friends of the People. Scott attended the execution of Watt on 15th October, 1795. In September 1797, Scott met Margaret Charlotte Carpenter (1770–1826). Three weeks later he proposed to her. He got engaged before he told his parents anything about her. This included that she was French and that her parents had separated after her mother's affair with another man. The couple got married in Carlisle on 24th December. His biographer has pointed out: "Scott... was not marrying for social position; he was not marrying for property. He was marrying for love and he was marrying a woman to whom he was intensely attracted." On 14th October 1798 Charlotte gave birth to their first son, but the baby died the next day. On 24th October 1798 Charlotte gave birth to a daughter, Charlotte Sophia Scott. Their son Walter was born on 26th October 1801. Later that year they purchased a new house at 39 Castle Street, Edinburgh. On 16th December 1799 Scott became the new sheriff-depute of Selkirkshire, at a salary of £300 per annum. He continued to work as an advocate but he still wanted to be a writer and he eventually published the three volume, Minstrelsy of the Scottish Border (1802-1803) and The Lay of the Last Minstrel (1805). The books were a great success and after providing his friend, James Ballantyne, with £500 became a partner in a printing business, James Ballantyne & Company. As David Hewitt has pointed out: "Scott promised to direct business in Ballantyne's direction, and in this he was supremely successful, for it was a condition in each publishing contract that his work had to be printed by James Ballantyne & Co. The business was highly profitable, but the firm was in continuous need of new capital to finance its growth, and the new capital came mainly from Walter Scott." Scott also contributed to the Edinburgh Review , a journal owned by his publisher, Archibald Constable, but he disapproved of its support for the Whigs and in 1809 helped establish the Tory journal, The Quarterly Review, with the publisher, John Murray. The first editor was William Gifford and contributors included Robert Southey and conservative politicians. The journal stood politically for preserving the status quo and was very hostile to the work of writers in favour of political reform. In 1809 Scott decided that John Ballantyne & Company would enter the world of publishing. Over the next few years Scott wrote and published The Lay of the Lake (1810), Rokeby (1813) and The Bridal of Triermain (1813). That year Scott merged his publishing interests with those of his former rival, Archibald Constable. Scott refused the offer of poet laureate in 1813 and recommended Robert Southey for the post. Scott now turned from poetry to the novel. Over the next ten years he anonymously published several novels including Waverly (1814), Guy Mannering (1815), The Antiquary (1816), Rob Roy (1817), The Heart of Midlothian (1818) and Ivanhoe (1819). Walter Scott was created a baronet in 1820. Scott, who had established the form of the historical novel, was an extremely popular writer. However, Scott's publishing ventures went bankrupt in 1826 and Scott found himself liable for a debt of £114,000. Scott worked tirelessly to pay off his creditors and over the next few years wrote Woodstock (1826), The Fair Maid of Perth (1828), Anne of Geierstein (1829) and Count Robert of Paris (1831). 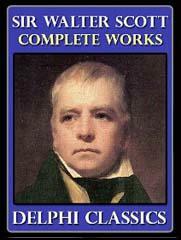 Sir Walter Scott suffered his first stroke on 15th February 1830. He retired as principal clerk to the court of session in November with a pension of £864, and soon afterwards suffered a second, damaging stroke. He made a slow recovery but in April 1831 he had a third stroke. He died at Abbotsford on 21st September 1832.